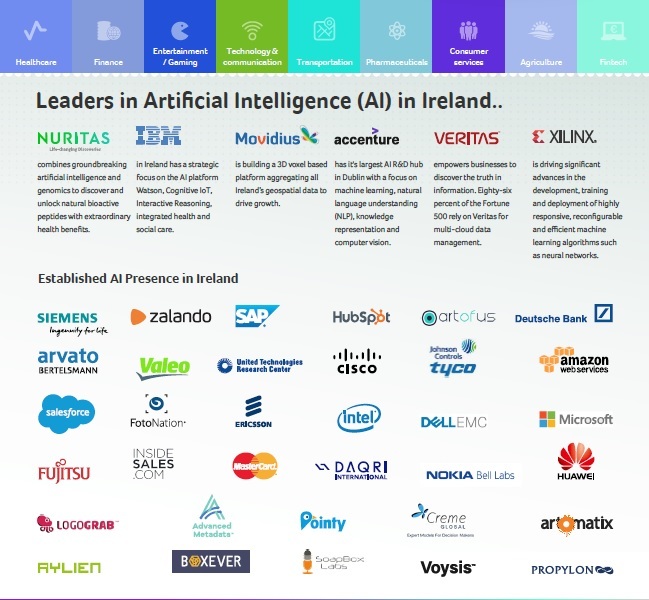 Last October, the IDA ran a campaign to highlight Ireland’s credentials as a global leader in artificial intelligence (infographic below), citing companies that have an AI presence here in Ireland including Soapbox Labs, Siemens, SAP, HubSpot, Amazon Web Services, Salesforce, Ericsson, Intel, Dell EMC, Microsoft and Fujitsu. It also promotes the work that locally-based research bodies are doing to power breakthroughs in the whole area of data analytics and enhanced machine learning. Ken Finnegan, chief technologist at IDA Ireland, told Siliconrepublic.com that Ireland is emerging as an important global testbed for trialling AI platforms “It is not a revolution, it is an evolution,”. It is widely accepted that artificial intelligence will transform modern society at an unprecedented pace. For some this raises many questions and worries however, everyone should feel lucky to be living in such fast-moving times and one that delivers results. McKinsey stated last year that “Overall, we estimate that 49% of the activities that people are paid to do in the global economy have the potential to be automated by adapting currently demonstrated technology.” Furthermore, this is technology available to use today and not in the future. The big question is, why now? One of the answers lies in Moore’s Law: 50 years of computing power doubling every 2 years, something that has held true for over 50 years. The primary processing units behind AI were originally used as gaming chips. The neural network training which is fundamental to machine learning became 60 times faster between the years 2013 to 2016 with most of that growth especially seen in 2015. Computer vision has gone from being useless to a utility in a small number of years. Computer face recognition has previously been deemed useless but now it is a basic utility and regarded as vital, as it recognises faces quicker and faster than ever before. Humans can only process a few faces at a time, but computer recognition allows for 200,000 faces to be recognised in real-time. Speech recognition has gone from useless to a utility too and in ways a lot faster than computer vision. Therefore, we have observed the rise of smart speakers such as Alexa – it currently has 75% market share of smart speakers in the USA. It is the growing power of AI, creating such concepts in a way that was never possible before. Within the real estate agency these actively change the way estate agents work. The possibilities are endless. However, it isn’t something you can afford to slack behind in as according to McKinsey “If you think you can let the technology develop and then be a successful fast follower, think again”. Professionals need to be proactive and tackle this as letting others gain advantage is a sure-fire way to lose money and let opportunities slide past by, machines are the way of the future. Computer vision is a powerful weapon and it understands what it sees in images and plans. Real estate searching will become less about descriptions via text but instead by images featuring style, features, likeness and feel. Around the world there are now thousands of high altitude satellites that allow people to view or analyse the space around us and further afield. Drones, video integration and BIM via satellite imagery analytics will become the basis of searching for potential buyers. AI will ensure that supply and demand can be matched while predicting accurate pricing for sales and lettings. Chatbots (if you are unaware of them) are one of the key AI tools which enable nurturing leads, organising viewings and listings, managing customer service and property management to name a few of the highlights. AI will also improve location accuracy and inform us of area, visual and market analysis while considering the wants and needs of clients to date. The rise of Alexa as mentioned will see more and more people talking to computers and expect to see auto generated report writing too. Marketing is all about knowing your customer and AI will allow estate agents to learn more and more. The ones who learn will hugely benefit from their efforts to change. Try to see the advantages of such technological advancements rather than feeling threatened at the very real prospect of losing your job to an AI. Remember that computers can only offer answers, but humans are needed to ask the questions. Understanding how to best leverage the skill set between computers and machines is vital as marrying the two yields the results required for successful businesses. Understanding what AI is good for and what it isn’t will steer you well in finding the factors to apply to business models. AI will give more options and will work on the input however, it is up to the business itself to output it correctly. AI will inevitably change the world by its accuracy and data specifics but there will be winners and losers regarding professionals in certain sectors. Redundant areas may arise but by paying attention you can stay ahead by using AI to your benefit while developing your own role in the business too. Finally, I recommend taking time to read the IDA report below entitled ‘Ireland AI Island’.